The manufacturer Samsung loves the platform strategy. This is a consistent base unit with a variable motorization (mainboard, chipset) and where the tops/lids are exchanged. Sure, this is good for the course of laptop manufacturing. 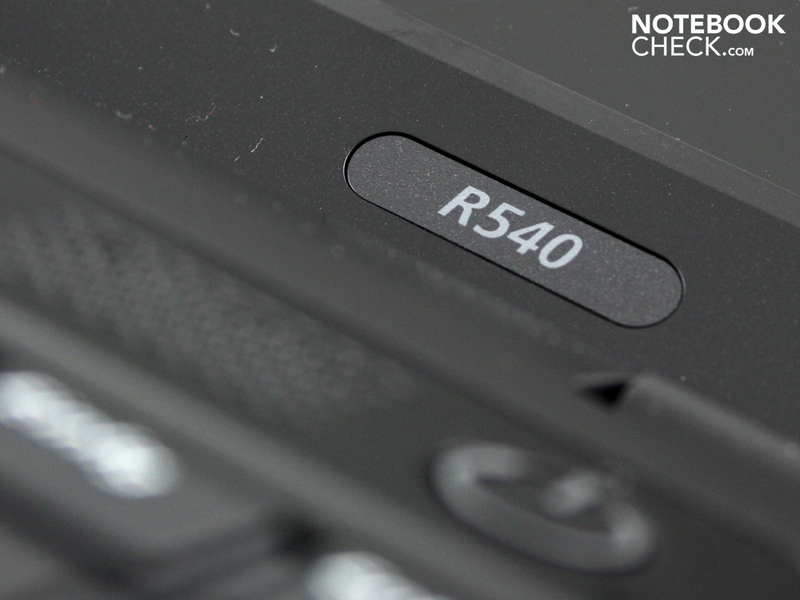 However, as a consequence the R525 Eikee, R530 Nolan, P530 Pro and the present R540 all have the same base unit. At the same time, they look different. Everything from matt to smooth, from coated to textured – the surface design couldn't be more different. In effect, the R540-JS08DE has a construction common with the R525 Eikee, R530 Nolan and P530 Pro. 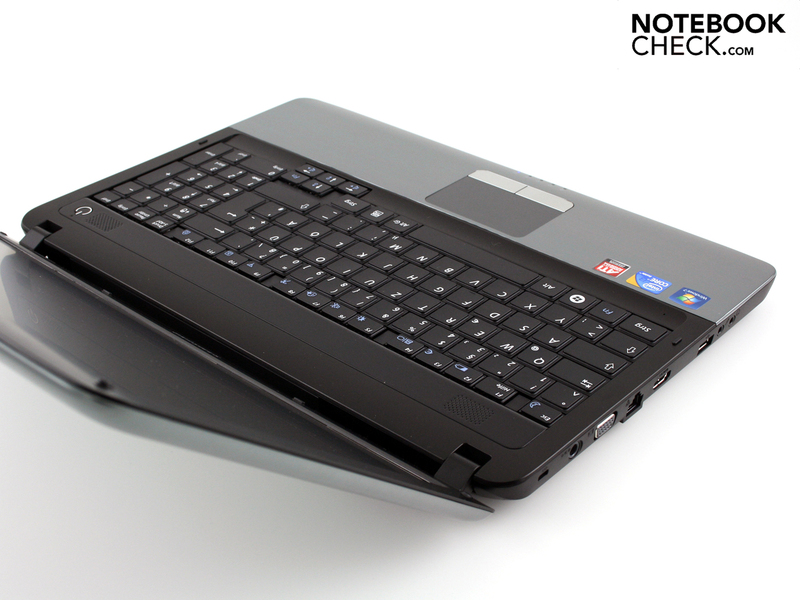 Nevertheless, we are facing an individual laptop that wants to be as much a heavy-duty worker as an entertainer or gaming machine (Radeon HD 545v). 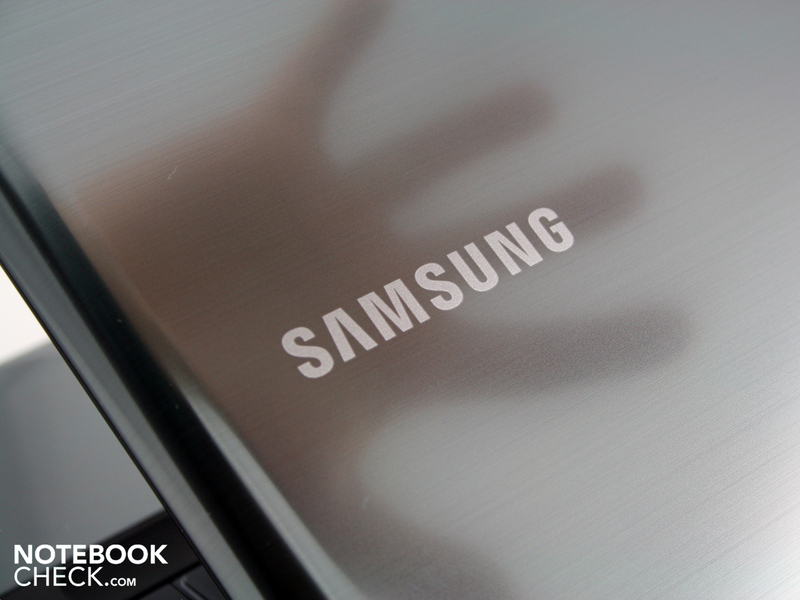 Find out in our review if Samsung's multi-purpose idea will work out. Will the matt display get along with the wrist-rest's mirror finish? Are the ergonomics just as perfect as in the sister model without a dedicated graphics card? Can the battery life live up to expectations? The R540 tries to attract attention with colorful effects and high-gloss utilization. The lid's and wrist-rest's finish are made of smooth plastic that has been evenly brushed horizontally. At least, the structure underneath the high-gloss seal lets you believe this. Samsung speaks of "premium design with color gradations in a subtle blue pattern" on the German website. We can't find the latter pattern no matter how hard we try. We would sooner call it metallic gray. The coated and uncoated plastic components are fitted cleanly. 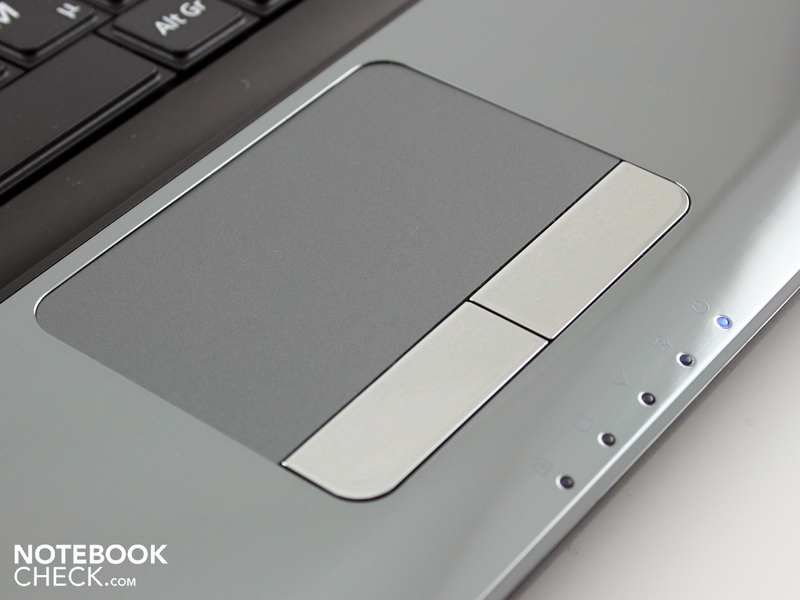 The coated lid, as well as the wrist-rest, is susceptible for fingerprints. 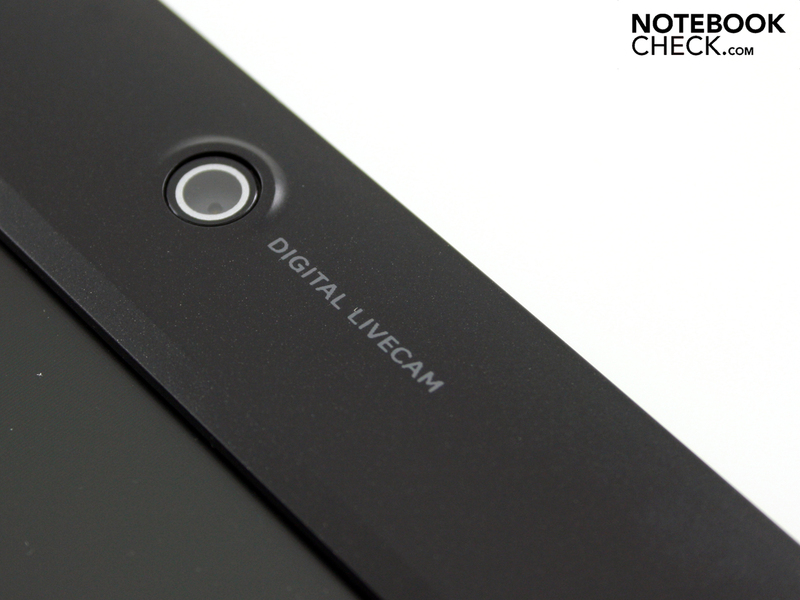 The surfaces mutate to a greasy fingerprint mess after a short time of use. The coated blue bar above the keys, underneath which the loudspeakers are located, isn't any better in this regard. The wrist-rest is basically stable. However, it can be depressed on the right with one finger. The case's bottom is also imperfect. 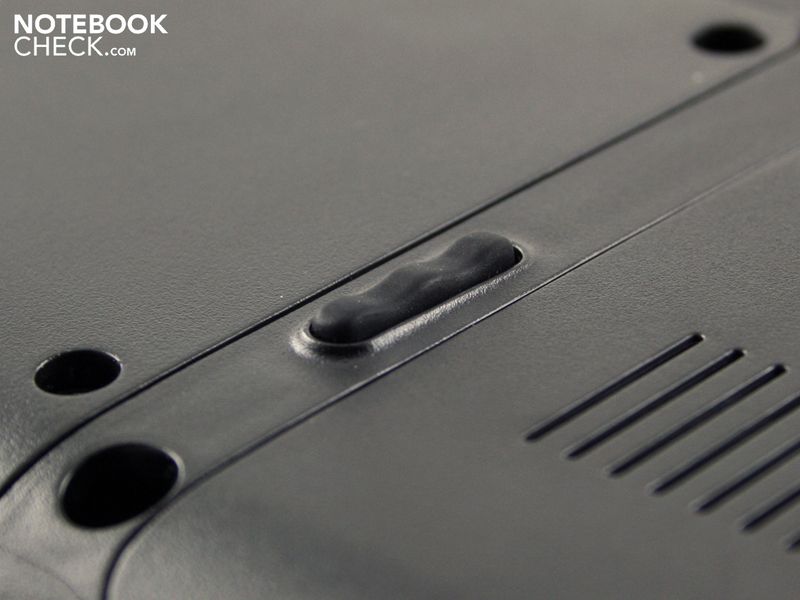 The RAM cover, alike the area under the optical drive, already yield when little pressure is applied. We also have to criticize the lid's stability. We can dent its surfaces evidently with little force. The torsional stiffness could also be better. In return, the hinges sit tight where they belong and hold the lid without teetering. The lid can be opened to a maximum of 135 degrees. A counterforce in the display hinge makes sure that the lid shuts clearly in the last five degrees of closing. Nevertheless, the force isn't great enough to prevent an opening of one centimeter during unsecured transportation. The R540 doesn't supply any especially strong capabilities in view of connectivity. Almost all connections are accumulated on the left. Beside the power socket, we find a VGA (D-sub), a USB port, a LAN socket, two audio jacks and a HDMI port here. The cardreader is on the front. The interface placement seems to be adequate. Both USB 2.0 ports on the right are placed in the far back. USB cables for peripherals (printer, mouse, etc.) can be lead around the back. Unwieldy cables, such as VGA, power and Ethernet on the left are so far in the back that they won't get often disturbing. A wireless module from Atheros (AR9285) does its job in the Samsung R540. It supports the fastest transmission draft-n standard. However, the cabled network card doesn't include Gigabit Ethernet (Marvell Yukon 88E8040 PCI-E). Bluetooth isn't installed. The software configuration with Windows Home Premium 64 bit doesn't include any recovery DVDs. Users should secure the recovery partition via Samsung's Recovery Solutions on their own data carriers. Samsung installs a larger amount of in-house tools. Easy Network Manager (set up WLAN locations), Samsung Update Plus (updates drivers), Easy File Share and Support Center (e.g. Battery Life Extender) belong to the programs that make sense. 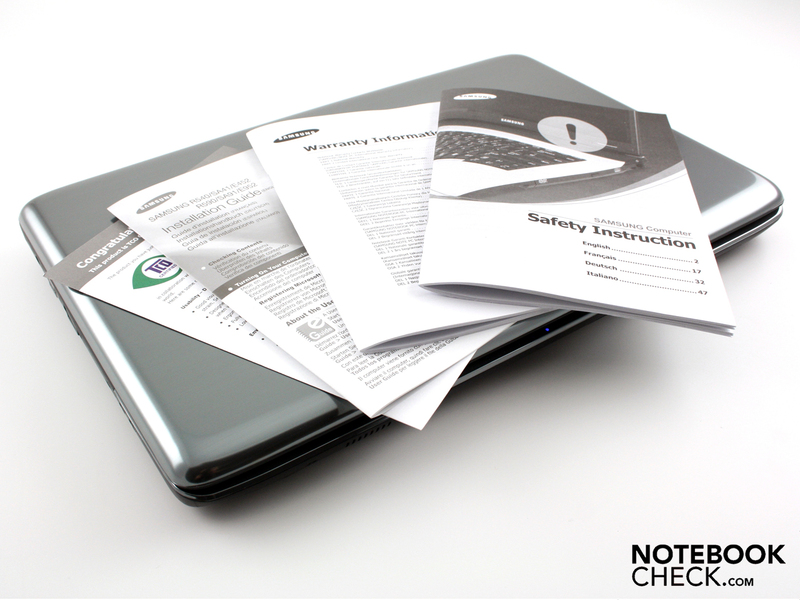 A manufacturer's warranty of 24 months is granted. Samsung calls its optionally available extension of the standard warranty Guarantee Plus. This includes an onsite pickup service for about 50 euros. Samsung installs a feedback-strong keyboard in the R540. The keys are close to each other and each one is on a small base. Typing accuracy is very good. The keys have a clear pressure point and a long key drop. The keystroke is firm. Merely the number pad's area yields (coils) slightly. It's a pleasure entering numbers or using the calculator with the number pad's standard layout. Just as pleasing: The spatially separated arrow keys protrude out of the key field by one centimeter. There is even enough place for a second FN key. We can control volume and brightness single-handedly and with closed eyes. The medium sized touchpad is almost even with the wrist-rest. 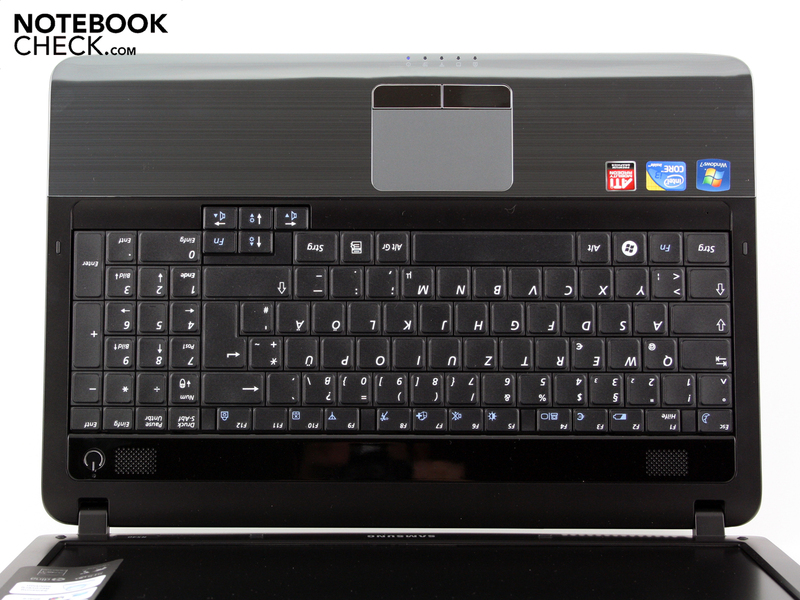 It can be distinguished easily due to the varying haptics (smooth versus dull). The pad is actually supposed to light up blue during use (rim), according to the manufacturer's website (LED touchpad light). However, the rim didn't light up at all in our test device. The pad can be used quickly because the matt surface bids enough resistance. The multi-touch option identifies two fingered gestures, e.g. scroll or zoom. The vertical and horizontal scroll bar can be used alternatively. They aren't optically marked though. 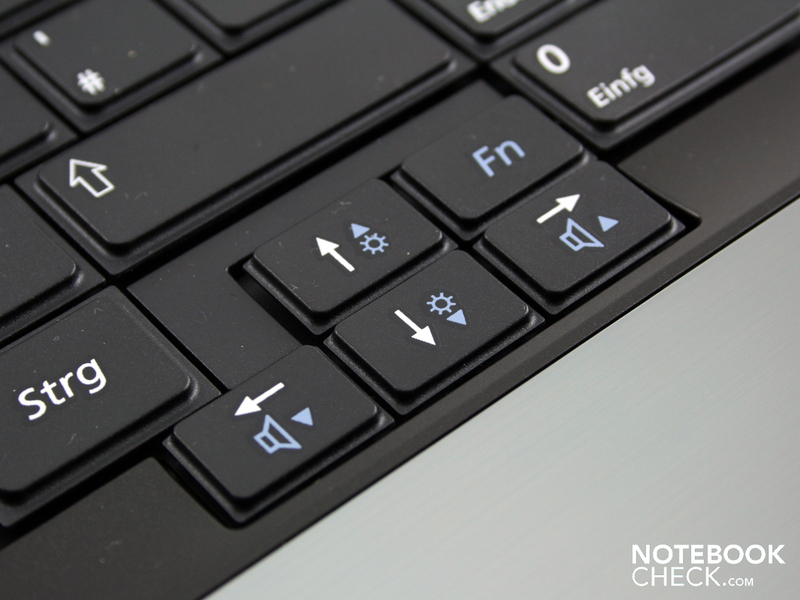 The keys have a medium pressure point, as well as a loud click noise that gets annoying after a while. 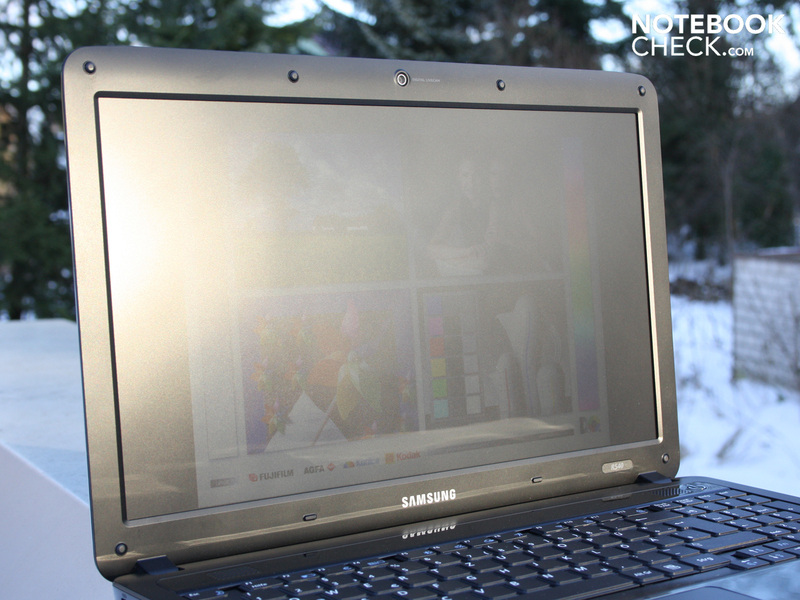 Samsung supplies the 15.6 incher with an own HD ready screen (1366x768 pixels / model: LTN154X3-L01). It is the same screen model as found in the R525 Eikee (consumer multimedia), in the SF510 (design multimedia), in the R530 (low budget) and in the P530 Pro (business, AR coated in this case). The run of the mill screen couldn't impress us in all of these devices. But at least it is antireflective in the R540. The TFT's contrast of 119:1 is extremely low and unsuitable for the multimedia claim. Brilliant colors are hardly ever an issue for office users. The AR coating has more weight here. 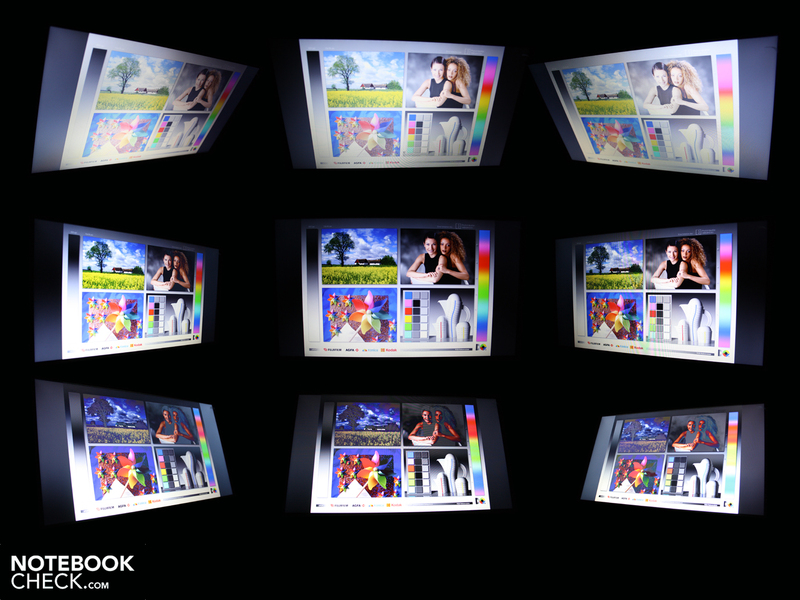 Nevertheless, we check the reproducible color spectrum and as expected find a low Adobe RGB (t) and sRGB (t) coverage. 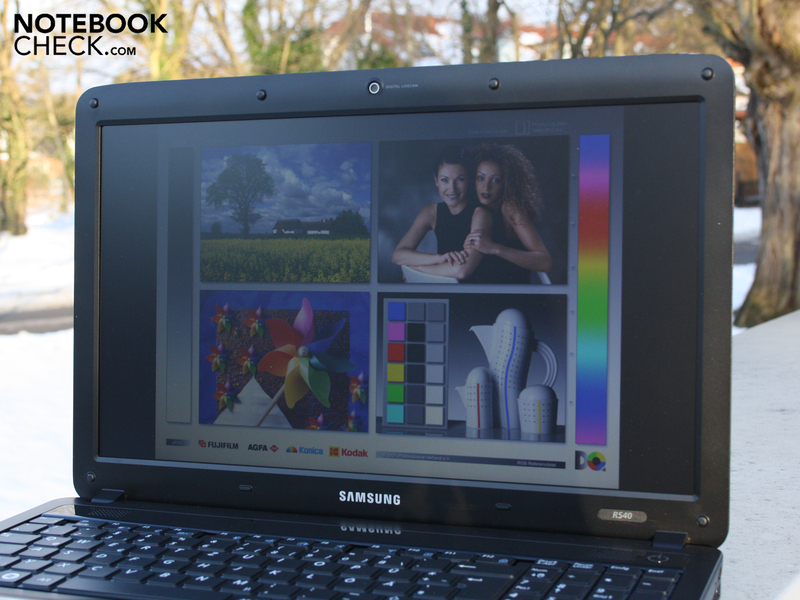 The Samsung R540's and a pro screen, as in the MacBook Pro 13 2010-04 (t) are worlds apart in view of contrast and color spectrum. 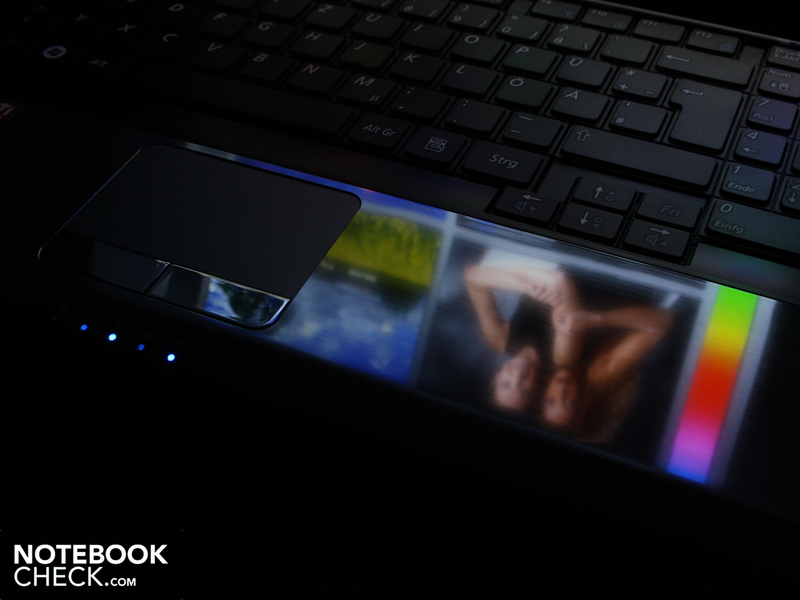 The LED backlight distributes the brightness (206 cd/m2 on average) adequately over the screen (86 percent). We determine a maximum rate of 215 cd/m2 in the upper center. This is more than sufficient for office use. In rooms, a screen is usually utilized with 100 to 160 cd/m2. The brightness decreases to 185 cd/m2 on the right. The differences aren't perceptible for the eye. The brightness is average for this notebook category. 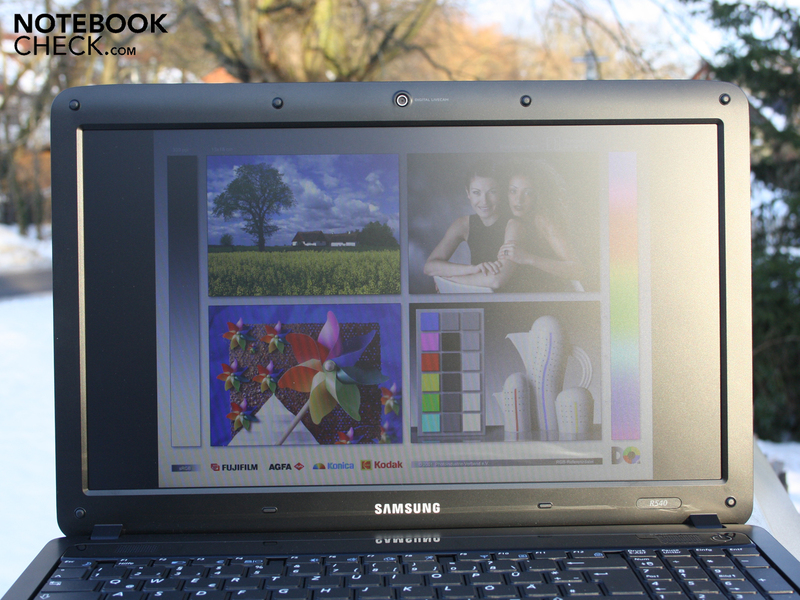 The viable luminance (206 cd/m2) provides pleasant viewing conditions in daylight. Reflections don't turn up due to the screen's AR coating. The side by side pictures below were taken in winterly, less intensive sunlight. The brightness isn't so strong that we can use the display in intense sunlight without problems at any time, though. Clouds or a shadowy place is recommendable in any case. Viewing angles describe if colors or writing is clearly legible from a lateral view on the display, or if the image dims and/or the colors invert. 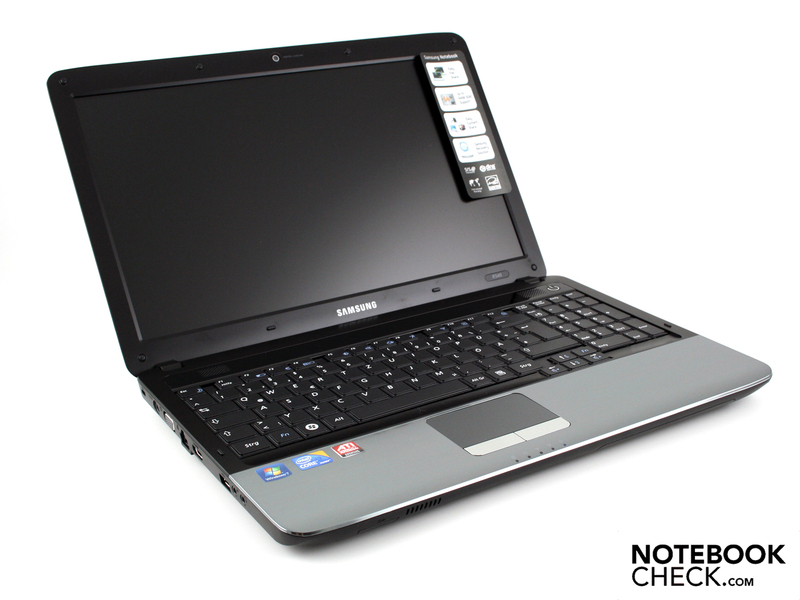 We have little leeway with Samsung's 15.6 inch R540. When our eyes stray upwards or downwards (vertically), the colors already start to invert at 15 degrees. Our view can deviate up to 45 degrees right or left (horizontally) from the center, however it shouldn't stray upwards or downwards (vertically) then. The colors first start to invert in larger angles than 45 degrees and the display dims. A 2010 Intel Core i3-370M processor (3MB L2 cache, 2.40 GHz) from the Arrandale processor refresh is installed. In descending order after i5 and i7, the i3 is the performance weakest Arrandale. The clock rate of 2.4 GHz can only be topped by the 380M (2.52 GHz) on the i3 level. In opposition to Core i5/i7, a Core i3 doesn't have Turbo Boost (dynamic overclocking). It does have Hyper Threading. HT supplies every physical core with a virtual one. The i3-370M dual core thus processes with four threads. A 4096 MB DDR3 RAM complements the array (two modules). How much performance loss do Core i3-370M (2.40 GHz) owners have in comparison to a simple i5 processor, such as the 430M or the 460M? The Samsung R540 achieves 3322 points when calculating with only one core (Cinebench R10 Single 64bit). An i5-430M with a lower clock rate (2.26 GHz + Turbo Boost up to 2.53 GHz) accomplishes 3200 up to 3400 points (various test systems). There is practically no difference. First a 460M (2.53 up to 2.8 GHz Turbo) sets a clear performance increase in single core computing with 3939 points (e.g. Acer Aspire 5820TG). Multi core calculations have more weight in routine work. If you, for example, render videos with Cyberlinks Power Director, you'll benefit from as many high clocked threads as possible. The i3-370M achieves 7474 points (Cinebench R10 Multi 64bit). That is on par with an i5-430M as in single core (7200 up to 7937 points, depending on the test system). The 370M however doesn't stand a chance against the i5-460M: 8342:8060 points; e.g. Acer Aspire 5820TG). So, the high clocked Core i3 doesn't have to hide behind lower clocked Core i5 CPUs. What does the system performance look like where the CPU plays only a role? The i3-370M system achieves very good 5719 points in PCMark Vantage. 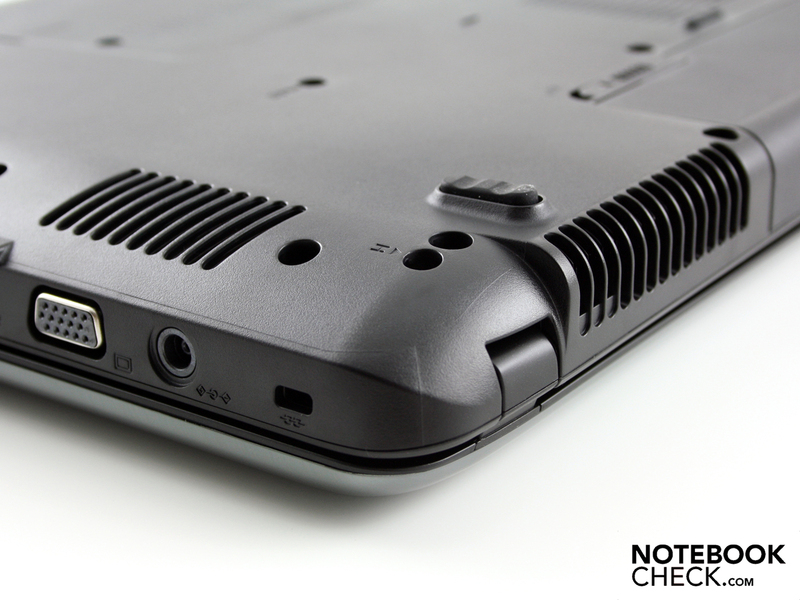 i5-430M laptops can often be inferior, especially when they solely have an Intel HD graphics. 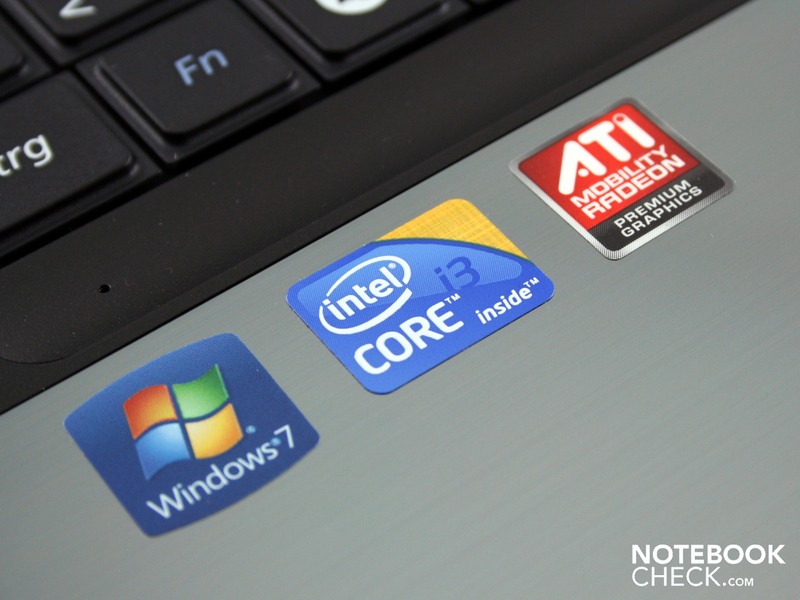 Core i5 laptops achieve 5100 on average. The good rate is primarily due to the comparatively fast hard disk (see hard disk). Secondly, the graphics card, ATI Radeon HD 545v, helps our test system to a good score. Applications that benefit from the HD 545v's hardware support (UVD2, Avivo HD), work a bit more efficient. PCMark Vantage also rewards this. The R540 has a 320 GB hard disk from Samsung inside (HM321HI). The 5400 rpm hard disk is generally quiet, but we can hear a rattling when listening a bit closer (while read heads are active). The sectors are read out quickly with 71 MB/s in sequential read (HD Tune). A slightly above average rate in the 5400 rpm category. The burst rate (HDD readout in one second) is unusually high: 104 MB/s. Both of these factors lead to quite high HDD score for a 5400 rpm HDD (PCMark Vantage sub score) of 3363 points. Samsung heralds the R540 with the keyword "fastest graphics performance" so "You can enjoy high-resolution movies and modern 3D games in HD quality" on the German website. 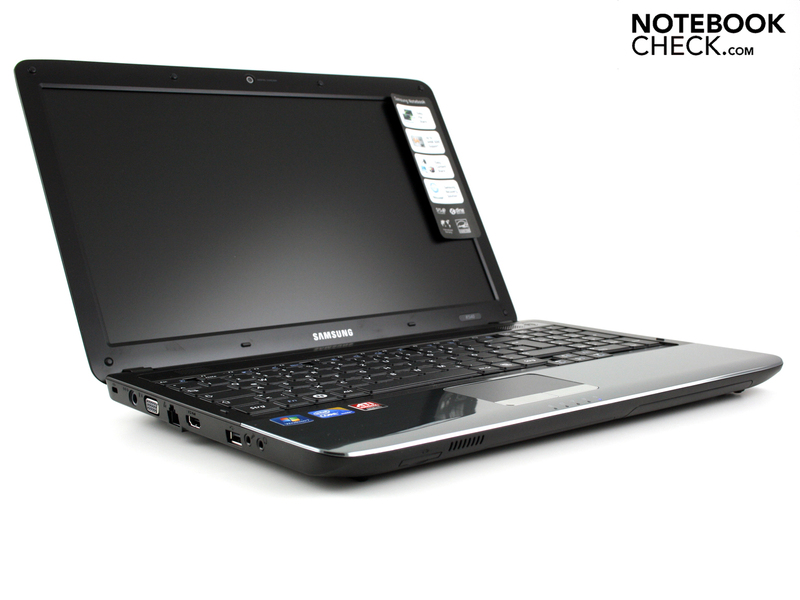 A look at our notebook graphics card comparison shows the ATI Mobility Radeon HD 545v in a completely different light. The weak DirectX 10.1 GPU is often installed in notebooks so that they even have a graphics card. The GPU has often proved its gaming inaptness (current games!). The Radeon HD 545v has a 512 MB GDDR3 video memory. It clocks with 800 MHz, the core with 720 MHz. Technically, the HD 4570 GPU is very similar. The latter's clock rate has only been increased. We determine weak 3831 points in 3DMark06. Even an Nvidia GeForce GT 325M with a lower clock rate of 450 MHz achieves 5943 points (Asus N61JV). 3DMark Vantage is hardly influenced by the processor and shows what the HD 545v is capable of. The determined 1249 performance points are far behind the latest gaming suitable GPUs, like the HD 5650 (2786 points) or the Geforce GT 425M (2543 points). We won't execute any gaming test in regards to the low 3D rates. 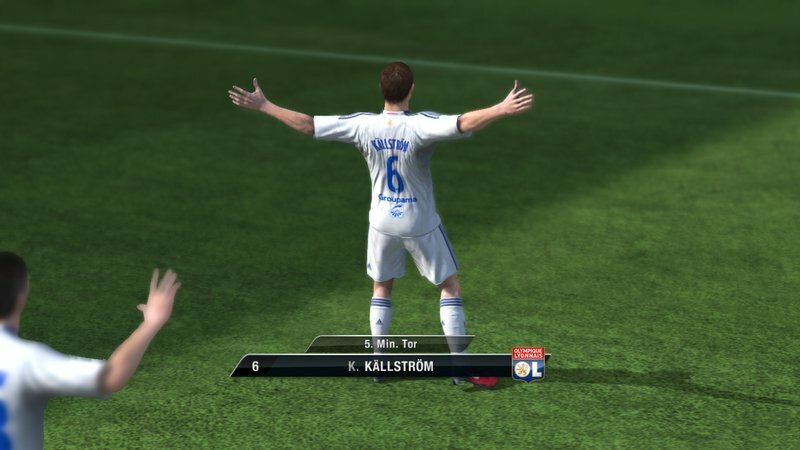 However, we run a random test with FIFA 11 – a modern, but undemanding game. The football game runs more than smoothly in the maximum resolution (1366x768) and high details with 53 fps. Games, like StarCraft 2, already cave-in to about 23 fps in medium details, as the MSI CX620MX-i3343W7P with the same GPU proved. 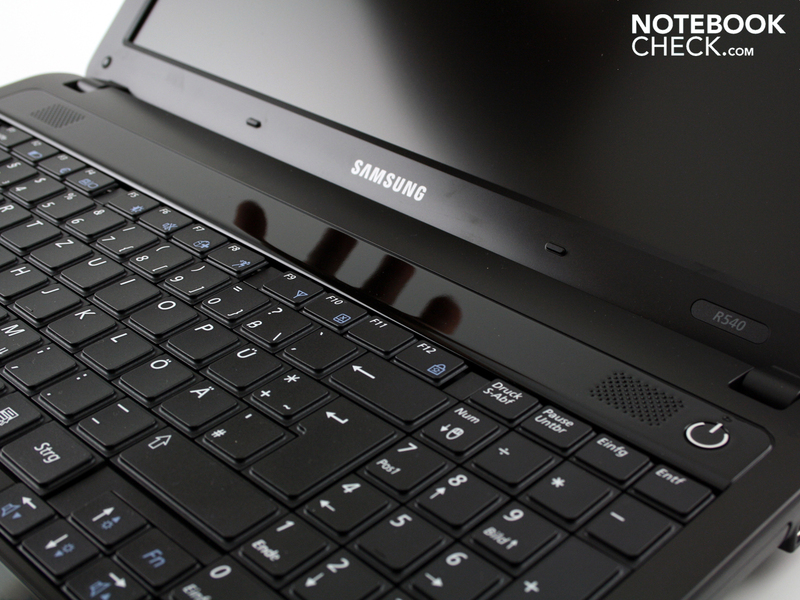 Samsung has already presented many ergonomically strong notebooks in the past. The test devices R580, R780, P580, N150, R530 and N220 proved to be very quiet and cool. Samsung's Silent Mode (FN+F8) is again installed and proves its usefulness once more. The fan stays disabled during simple office tasks, like Word, Excel, mail or web browsing most of the time, even when the processor is loaded for a short time. First permanent CPU utilization prompts the fan to take action even in Silent Mode. However, the noise is hardly audible with only 32 dB(A). Silent Mode's quietness is paid for with a lower performance. The Core i3 processor's clock rate is limited to 990 MHz. This is of course enough for surfing or typing in Word, but the system gets tormentingly slow when running Photoshop or a game. What does it look like under full load (stress test)? The fan now rotates at full speed. The noise level doesn't exceed 38.6 dB(A), though. We executed the test in Samsung's speed mode. Switching from standard to speed mode doesn't have any impact on the performance or the fan's rotation speed. The case remains lukewarm while surfing on the web and writing emails (Silent Mode). However, the temperature increases to 41 degrees in the vent's vicinity. That is even a bit higher than under stress. The reason: Silent Mode causes a slight heat accumulation in the case. Thus the temperature chart (idle) shows a higher temperature in certain spots than the same graph under load. The temperatures hardly vary during maximum load. The average temperature increased by just 2 degrees after a two hour stress test (Furmark and Prime95). The system's sensors record a maximum CPU temperature of 79 degrees Celsius under load. This rate is unalarming and speaks for excellent heat dissipation. The stereo speaker's quality can convince undemanding office users, but will hardly impress music fans. The latter will use external speakers or headphones because the sound is treble-heavy. The sound improves slightly with the SRS sound enhancements (balanced / surround). The volume is adequate for a 15.6 inch device. The little speakers are undistorted in maximum volume. External speakers or headphones are connected via the 3.5 millimeter jack on the left. The level tethered to the notebooks makes a static free impression (audio test – no measurement). The 540 is suitable for on the go with the adequate brightness, the good inputs and antireflective display. Well, wrong. The short battery life prevents mobile use in the train. If you are intending to use a UMTS surf stick for mobile internet, you're chances will be even worse due to the increased power consumption. The reason for the short runtimes is especially the battery's low capacity of 4000 mAh (44 watts). The dedicated graphics also takes its toll on the battery. You don't even have two hours for internet surfing (WLAN test). The R540's idle battery life is 238 minutes. These 3:58 hours are regrettably unrealistic for real life use. 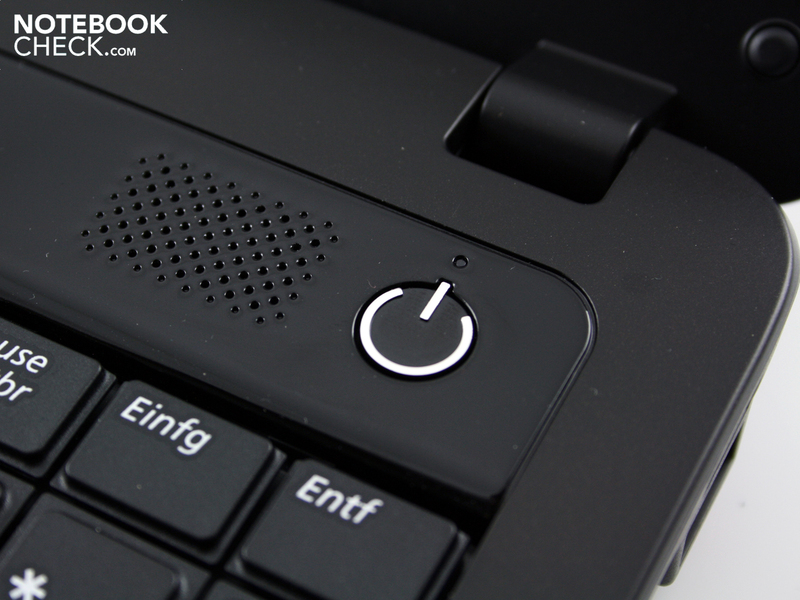 WLAN disabled, brightness in the lowest setting and processor idle – no one uses his notebook in this way. The manufacturer's specifications of "up to 4.0 h" are thus theoretically possible, but hardly achievable in the practice. The charge time of about two hours is about as long as the battery life and therefore not exorbitantly long. The R540 follows the latest trend and is energy saving. At least, you could believe this when 13.7 watts (minimum) in idle are considered. 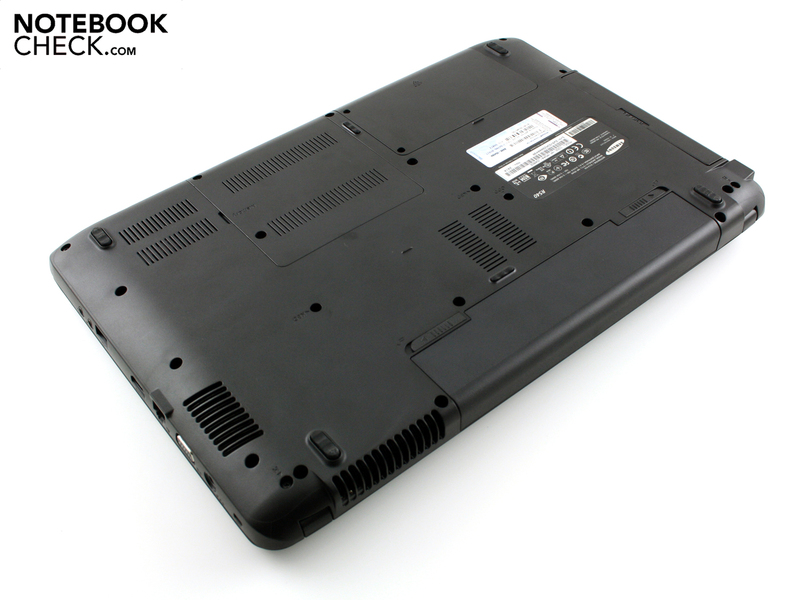 However, when we think of the 17.3 inch Toshiba Satellite L670 Pro with 9.0 watts, the R540 looks downright wasteful. An average of 20 watts (balanced profile, standard mode) is realistic in office use with low load. We determine the power consumption in a stress test with Prime95 and Furmark. 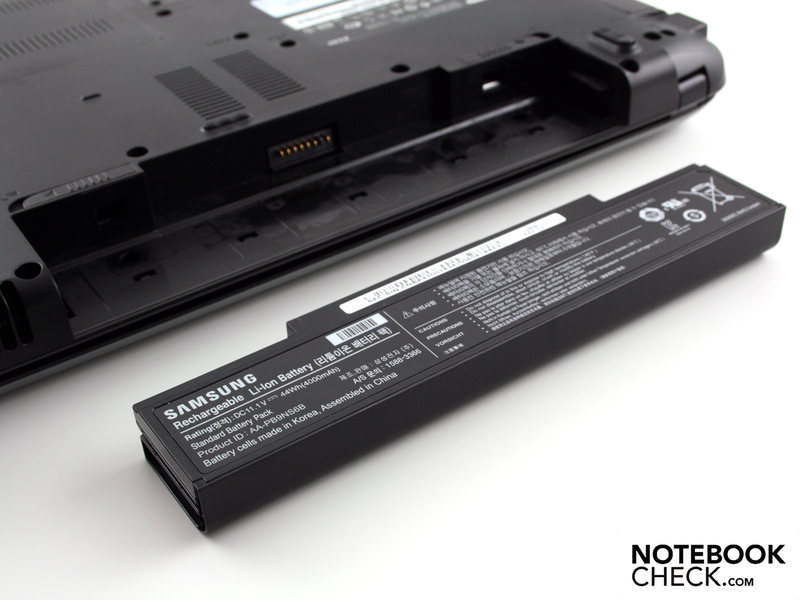 The battery is removed for the test. The multimeter shows 73.8 watts. 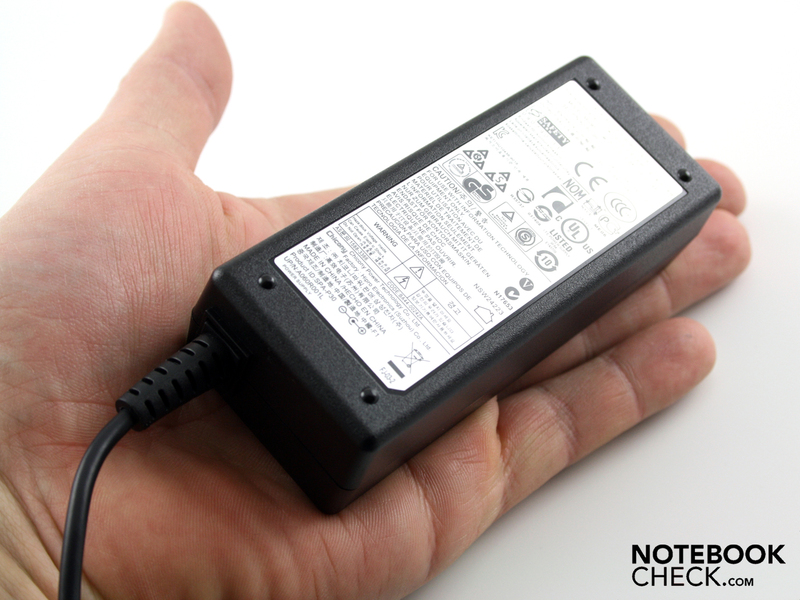 The small 65 watt adapter (252 grams) appears a bit overburdened in our opinion. The power adapter's temperature of 52 degrees under load isn't yet alarming, though. Moreover, our stress test is an unreal energy scenario. The efficient power is about 55 watts during a computer game (3DMark06). 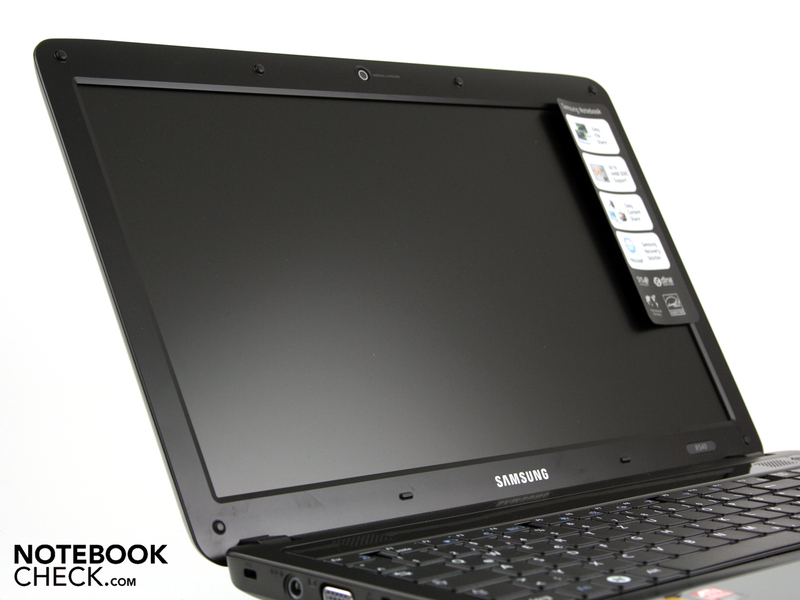 Samsung offers a smart 15.6 inch device including basic multimedia configuration with the R540 (NP-R540-JS08DE). It's up to the customer to decide if it is an office or a multimedia device. The matt display, the prolific typist suitable keyboard and the low emissions (Silent Mode) advocate office use. 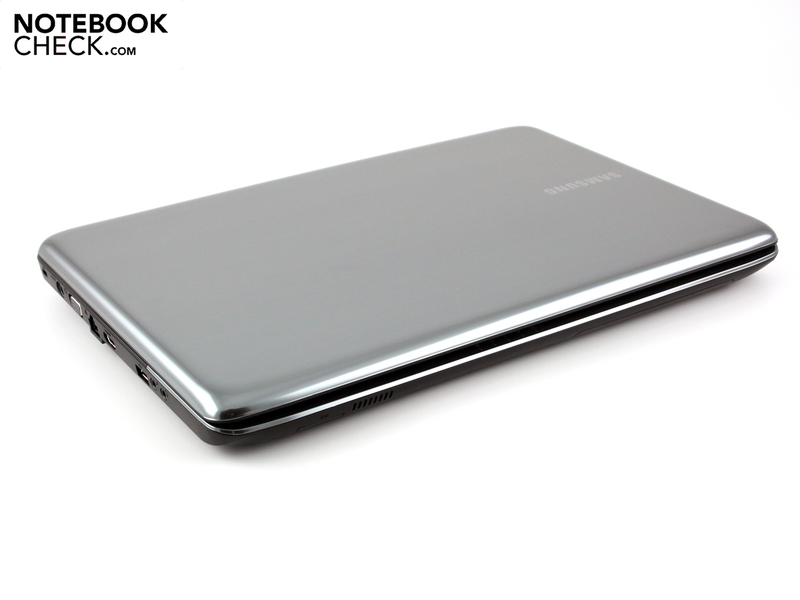 Samsung calls the R540 a "lifestyle notebook" and speaks of "the fastest graphics performance" (German website). 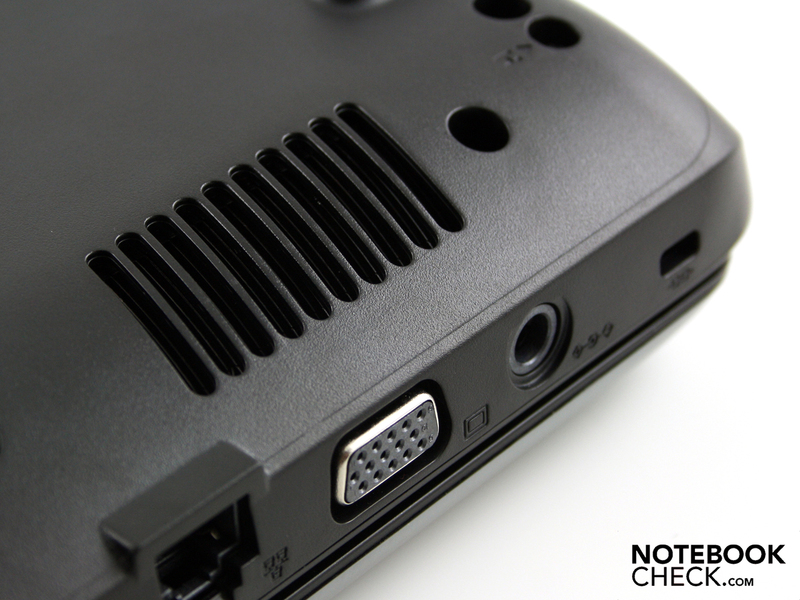 We can't say that the ATI Mobility Radeon HD 545v (DirectX 10.1) has a good gaming suitability, though. The latest, hardware intensive games run at best in low details and resolutions. If you have a soft spot for casual gaming and love older games, you can actually play on the R540. 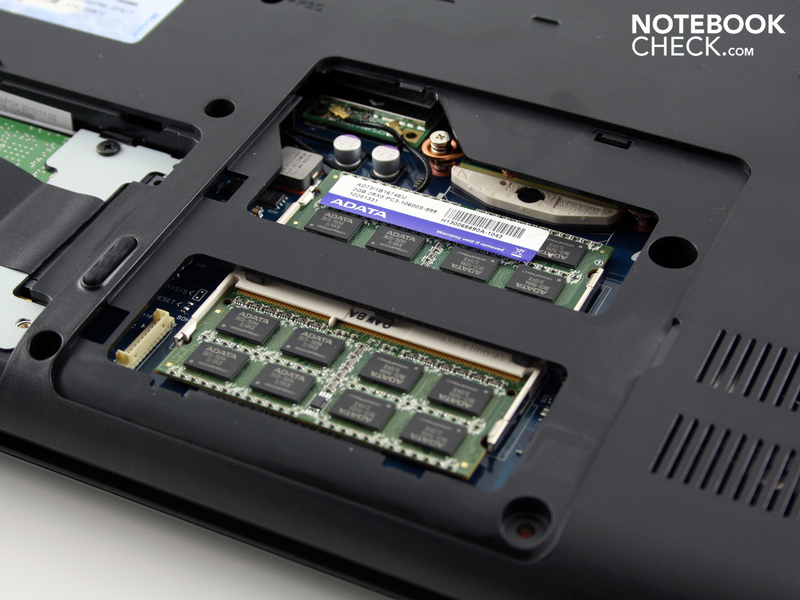 See our comparison of laptop graphcis cards for more information. The low battery life and spartanic connectivity add up to the drawbacks. In particular the battery's weak capacity of 4000 mAh does not even allow a whole two hours (WLAN test). Elegant design. At a great price." Samsung still makes cutbacks on the webcam and only installs 0.3 MP (VGA, 640x480) once again. The connectivity is rather modest: no eSATA and no USB 3.0 (cardreader). as well as the four gigabyte RAM (2x 2048 MB). The battery can be removed for permanent use at the mains. It doesn't have any feet. 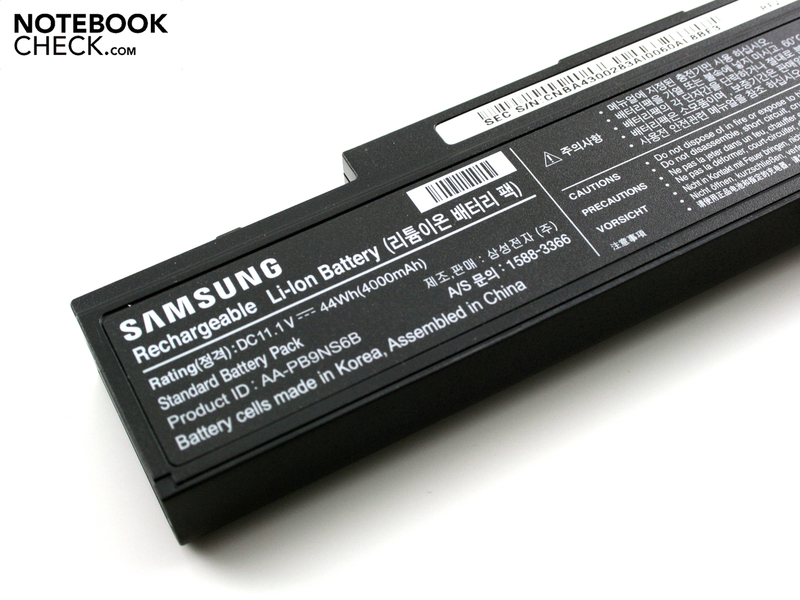 The battery only has a low capacity of 4000 mAh (44 Wh). 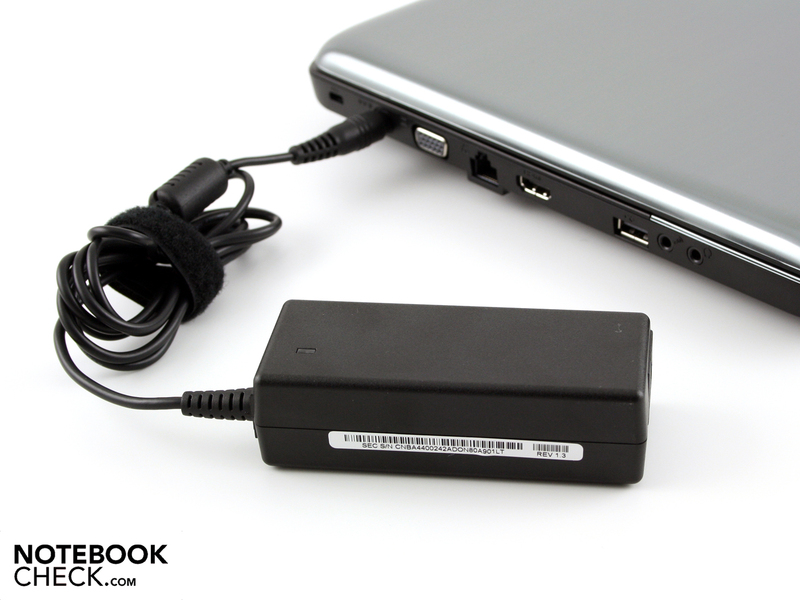 The power adapter supplies 65 watts. A bit tight for the maximum power consumption of 74 watts. The adapter is handy and only weighs 252 grams. The supply division reports: No DVDs, only a quick guide and warranty documents. 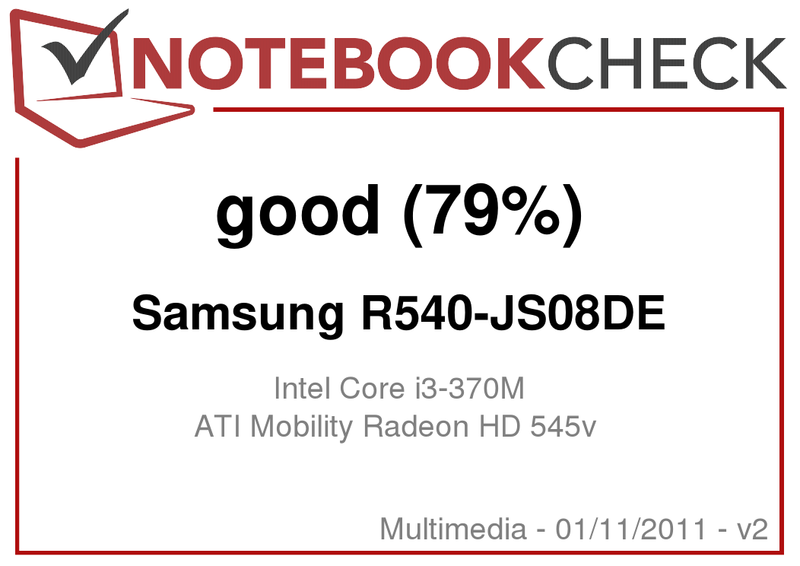 Samsung R540-JS08DE: Matt display and good keyboard are apt for the desk. The cooling system is very quiet even during computer games (air intake). The R540 has a secure stance. Two additional feet have been mounted in the center. Samsung's 15.6 inch R540 vies for customers with this slogan. The antireflective HD Ready display is supposed to be only one of many purchase arguments. Even the newest games are run in HD with Intel's Core i3-370M beside a dedicated ATI Mobility Radeon HD 545v. Potential buyers shouldn't pay attention to this marketing deception. The GPU belongs to the entry-level. The case has literally been "refurbished". a mirror-finished, slippery metallic gray is now on the desk. but the good keyboard is beyond all doubt. The base unit is rather stiff. It can only be slightly deformed. 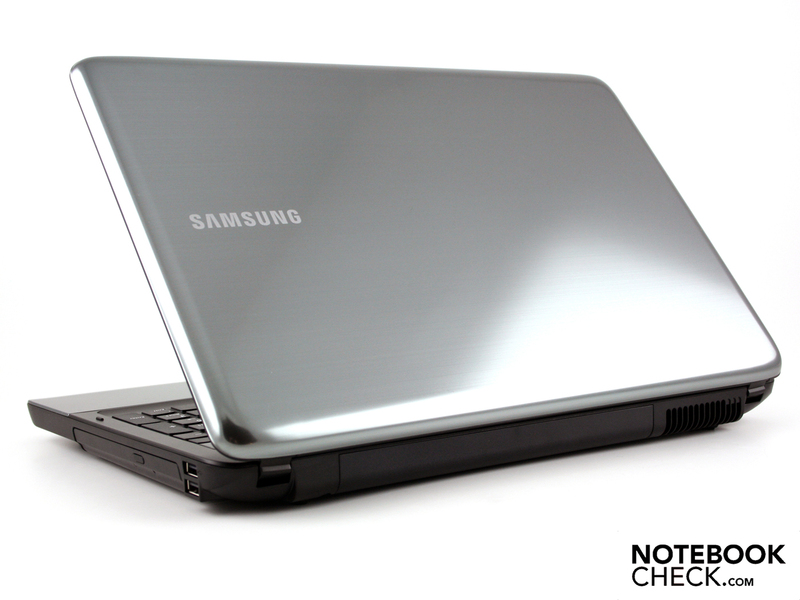 Samsung R540-JS08DE: Core i3 CPU and Radeon graphics speed up the system very congenially. The greasy finger wrist-rest deters the office worker. It would have been a comprehensive office notebook without this compromise on the style factor. The popular use of the term "fastest graphic performance". The HD 545v definitely doesn't belong to the performance machines.